Penetration testers are skilled professionals responsible for finding, exploiting & reporting vulnerabilities before malicious hackers do. It is without a doubt a security’s best practice —when done right. 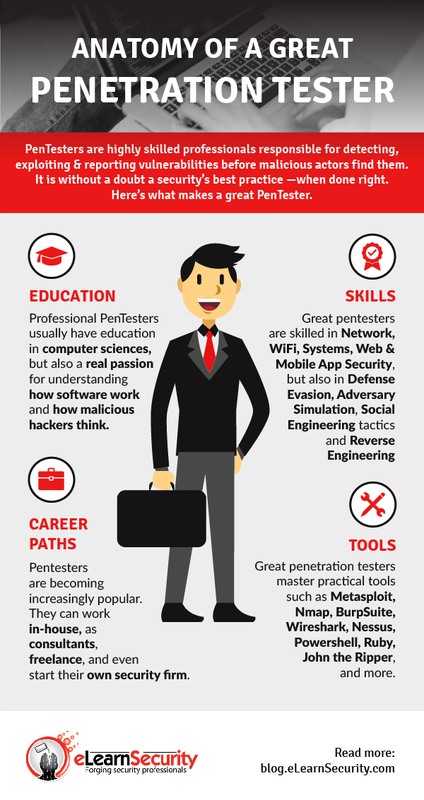 Here’s what makes a professional PenTester. There’s no doubt that penetration testing is a highly practical job. To become a professional pentester, you must not only have background knowledge of computer sciences, networking and programming, but also know the pentesting methodologies and, of course, how to actually perform tests on a various range of systems, applications, networks, WiFi, etc. One important part of the penetration testing process is the reporting phase. A professional penetration tester knows how to redact thorough pentest reports in words that both technical teams and C-level execs can understand, as he will most definitely be judged on the quality of this report. Get a free PTS training course in Elite Edition when you enroll in PTP! Aspiring to become a professional Pentester? On the occasion of our Beginner Month, we’re offering a free Penetration Testing Student (PTS) training course in Elite Edition with every enrollment in the Penetration Testing Professional (PTP) training course until February 28.